New Listing Shannon Crystal Ireland Hurricane Votive Candleholder with shade 9" New in box. Shannon Crystal Ireland Hurricane Votive Candleholder with shade 9" New in box.. Condition is New in box. Shipped with USPS Priority Mail. Shannon Crystal Designs of Ireland 24% lead crystal pillar candle holder. Fluted column design. Very heavy and substantial. Hand crafted in Slovakia. Label on base. In excellent condition. 3" x 3" not sure if they where used. 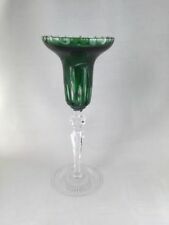 24% Lead Crystal Cleo Hurricane Candle Holder Imperial Crystal 12"
Very heavy glass. In new condition. Godinger 2pc Lead Crystal Hurricane Candle Holder. Lexington Pattern. Includes Globe & Stand. Vintage Karat 24% Genuine Lead Crystal Candlesticks - 5 Inches. Condition is Used. Shipped with USPS Priority Mail. Candlesticks are in excellent condition with no chips, cracks, or defects. Pretty pair of Wedgwood crystal candlesticks. Were a gift 40 years ago and have never been used. Excellent condition. Still has "Wedgwood Lead Crystal made in West Germany" label on the side of the base. The ‘Thomas’ Signature is etched on the underside and it varies slightly between the two.one is more ornate than the other. Estate find, so I do not know the age or history. These are marked Kristaluxus 24%. This is a pair of Gorham Lead Crystal LOTUS Candlesticks. The sticker reads: Full Lead Crystal GORHAM Germany. These are New. S ET OF 2. SHAMROCK CANDLESTICKS. G ALWAY IRISH CRYSTAL. Although these look identical the bases are different. I will then submit the. The older the item, usually the more the wear. received as not described" Need assistance?. back in full. I am sorry for any inconvenience this causes. Shannon Crystal Votive Candle Holder~ Design of Ireland~ . Condition is Used. Great condition.See pictures as they are part of the description. Stands approx 4 1/2" tall. Any questions feel free to ask. Shipped with USPS Priority Mail. These are both brand new with no damage. Ships via USPS Priority. Let me know if you have any questions. Thanks! Pair of Vintage Godinger Silver Art Co Pedestal Base Crystal Candle Holder 10"
This crystal votive candle holder is in very good condition. It does have a pin size tiny spot that looks like a bubble pop. The holder is crystal clear and very heavy for its size, weighing nearly 2 lbs. NEW Hollywood Regency Style Godinger Shannon Crystal Empire Candlestick 6 8 10"
New ListingCut Lead Crystal 2pc Hurricane Candle Holder - Approx. 10.25"
Beautiful 2pc Hurricane Lamp Style Candle Holder. It's Approx. 10.25" tall and 5" wide at the base. 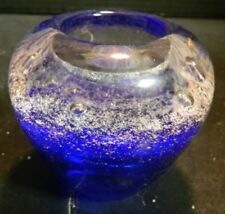 Crystal candle holder signed Oleg Cassini in excellent condition! Fifth Avenue Austria Lead Crystal Candle Holders 24% PBO . Condition is Used, but candlesticks appear unused, in beautiful condition. Lovely light reflections from cut beads on stem. Will be stunning with lit candles. Ht 4.5" x 3.25" Diam. Opening for taper is an inch diameter. The set of two appears delicate and has graceful lines. The pair of candlesticks is absolutely clear, despite any appearance of discoloring. This would be solely attributable to camera user error. Shipped with USPS Priority Mail. No visible signs of cracks, or chips, original labels still on candlesticks. Please feel free to contact me with any questions. PAIR OF TOY NUTCRACKER CANDLESTICKS. 24% LEAD CRYSTAL -- MADE IN USA. Colors may appear. I am more than willing to work out any issues ! slightly different in person due to the variability and condition of your color monitor. Shannon Crystal Pillar Candle Holder with original Sticker. Shipped with USPS Priority Mail. I love Cobalt blue. This Crystal bowl is small but a perfect size to hold a tea candle and sit on a table just being pretty. These pieces are 4 1/4" high, 2" across the top, 1" candle opening and they have a 4" base. Really a superbly cast crystal skull for Halloween or any Occult or glass collection. 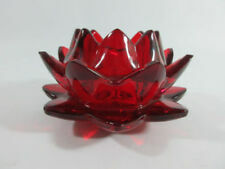 Up for sale is a Godinger Set of Two Shannon Crystal Lotus Candle Holders in Original Box. Any questions feel free to send me a message. Thanks. The candle holder has a fan & diamond cut pattern. It has beautiful clear color with a crisp clean crystal cut. It a stunning piece for any table setting or display. THERE IN VERY GOOD CONDITION. SEE PICTURES FOR DETAILS. 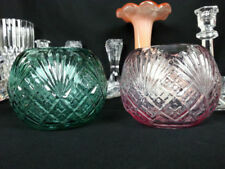 Villeroy & Boch Two Heavy Cut Crystal Glass Candle Holders Hand Made 6.5"& 41/2"
crystal lotus flower candle holder. Shipped with USPS Priority Mail. Pair of Crystal Candle Stick Holders Miller Rogaska Richmond Gold Trim 7.3/4"
Never used pair of Miller Rogaska candlesticks. Mint condition. No anomalies throughout both pieces. A minimal amount of oxidation of the gold rims, as depicted in the photos. Beautifully crafted, maintained with stickers still attached to both candlesticks. Signed by Rogaska. Please see the photos for validation. The candlesticks are each approximately 7.75 inches tall and 3 inches bottom rimmed. Gorgeous set of 2 crystal glass candlestick holders by Cristal De Sevres in the "Jupiter" pattern. This elegant set of crystal candlestick holders have an art deco pillar squared shape to them. Very well made, the edges are fairly sharp to touch. Mix & match with other candle holders for a fabulous display! 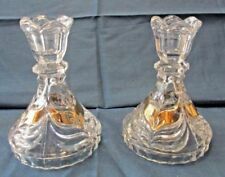 crystal hurricane candle holders; set of two; 24% fine lead crystal. 2 piece construction; Top doubles as stand alone; lamp uses votive, tea light or taper candles. Shipped with USPS Priority Mail. Crystal Hurricane Candle Holder 12" St. George 24% fine lead crystal 2 piece set. 12" HURRICANE CANDLE HOLDER 24% FINE LEAD CRYSTAL This listing is for a 2 piece Hurricane to protect a candle when lit. Candle not included. The Hurricane is etched in the glass. It can be used for taper, votive or wide candles. Pedestal: 5 1/4" tall, rim 4 1/2" wide Hurricane: 6 1/2" tall, rim 4 1/2" wide There are no chips, scratches or cracks. Item is BRAND NEW and never used. Comes with original box. (See Pictures 9 thru 12). 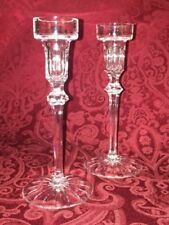 Val St Lambert Fine Crystal Candle Stick Holder Elysee ~ 7" tall - Set Of 2 Set of 2 used sturdy fine crystal candle stick holders. Name stamped on base of candle holder. Overall very good condition with normal wear and tear. Base has scratches and very minor knicks. All knicks are very minor and hard to see. Knicks discovered by touch during examination. Please see pictures for condition and size measurements. Free shipping. This is just gorgeous! New in box. Was never displayed. Box is in great shape. This is a beautiful set in great used condition. 2 - Shannon By Godinger Crystal South Beach Palm Tree Candle Holder Vase 7 1/2"
Shannon Crystal Ireland Hurricane Votive Candleholder with shade 9" New in box.